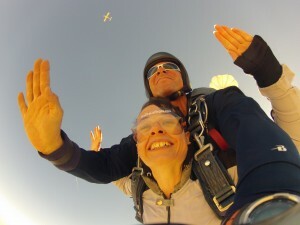 Skydiving last month was beautiful. It was easier than I expected. 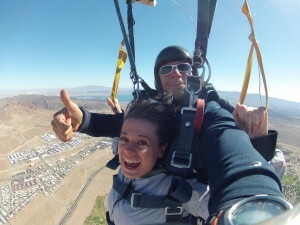 On April 14, Rachelle and I went skydiving with Skydive Las Vegas, along with another local couple (who actually met at one of my workshops). 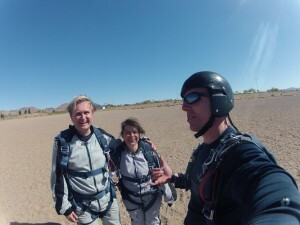 As far as I know, this place only offers tandem jumps, so that’s what we did. This makes it easy since you’re strapped to an instructor who handles opening the chute and tells you what to do. The only real work is to get your body into the correct position as you exit the plane. Gravity takes care of the rest. We picked a beautiful day to go. It was around room temperature on the ground, but higher up it’s a bit colder. It wasn’t cold enough to be a bother. The cold felt refreshing on the way down. The whole experience went by quickly. From the time the plane took off until the time we were back on the ground was probably less than 30 minutes. I’d say the entire experience from when we arrived until when we left was about 2.5 hours. With driving time from my house, it was about 4 hours door to door — a nice way to spend a Monday morning. Before jumping, we had to watch a short video explaining what to expect and the various risks involved, including the risk of going splat on the ground. Then we had to sign a liability waiver, the likes of which I’d never seen before, basically stating that no matter what hideously catastrophic outcome might possibly occur, we wouldn’t even dream of suing the place. The plane ride up took about 20 minutes. 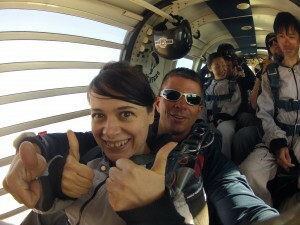 In our group there were 7 jumpers and 7 instructors, so we had 14 people packed into the back of the plane. We all sat down straddling long wooden benches that ran from the front to the back of the plane, so then we could slide down the benches towards the exit door when it was our turn to jump. Rachelle was the first one from our group to jump. I was the last. That was due to the order in which our instructors put us on the plane. It was loud on the plane, so we couldn’t engage in much conversation. When the door opened it was super windy — and a bit cold. 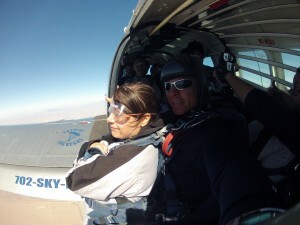 When it was my turn to jump, I basically just let my instructor lead and went with the flow. He seemed pretty happy and very non-suicidal, so I figured everything would go according to plan. It did. I didn’t notice any stomach-drop feeling upon exiting the plane. It was a little disorienting at first as we spun around a bit, but soon we were facing the ground as planned. It felt more like having a powerful high-speed fan blowing at me than actually falling. Many roller coasters are more intense in terms of the physical sensations. Imagine being strapped to the front of a car driving 120 mph (about 200 kph). That’s what it felt like — super windy! Emotionally the experience was fun and exhilarating. 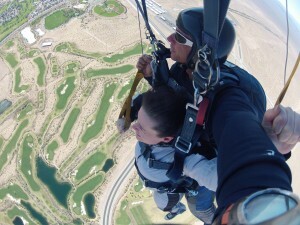 Freefalling felt surprisingly peaceful and serene, albeit very windy. 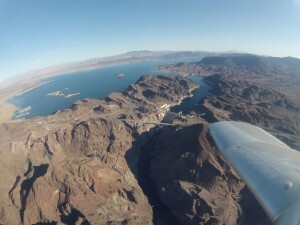 I enjoyed seeing the beautiful scenery on the way down, although it was a bit blurry since we were going so fast and I was also wearing goggles. When the chute opened, I felt this feeling of heaviness as my body hung from the harness. The straps actually hurt my inner thighs a bit, especially as we turned. 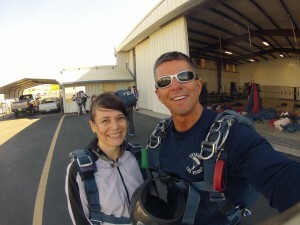 Shortly after our chute opened, the instructor handed me the straps and gave me the opportunity to steer. That was kind of fun, but the harder I turned, the more painful it was with the straps pushing into my thighs. I would have enjoyed doing more of that if it wasn’t so physically uncomfortable. 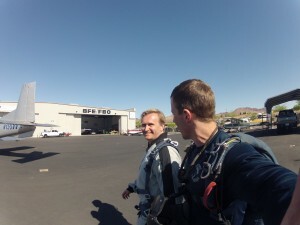 After descending with our chute open for a few minutes, the instructor told me to lift my legs up to prep for landing since his legs are supposed to hit the ground first. I expected this instruction… just not so soon. I thought he was doing it way too early since I estimated we still had about 90 seconds before we hit the ground. In reality it was probably more like 20 seconds — the ground came up faster than I expected at the end. Since I was the last off the plane and therefore the last one to land, it was a really interesting perspective to see everyone else on the ground as I approached from the air. They looked so small, like ants from high above. It was a surreal sensation, like being in some kind of 3D simulator, as I watched their tiny little bodies scale into full-sized human beings as I descended. Landing was fairly easy. 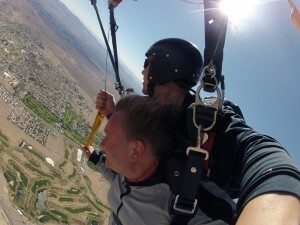 The instructor tugged on the chute straps just before we hit the ground to slow our descent, so we landed gently on our feet. There were other staff members nearby to help steady us. Cost-wise, the jump was around $200 per person. Then there are various upsells if you want a video or pics of the experience. I wasn’t planning to bother with these initially, but a reader who’d previously gone skydiving highly recommended splurging on these extras for my first jump, suggesting I’d regret it if I didn’t. I’m glad I took his advice. These extras make it easier to remember what the experience was like and to share it. 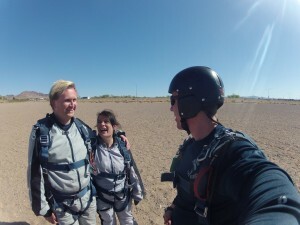 Imagine a skydiving recap post with no pics — that would be pretty lame. 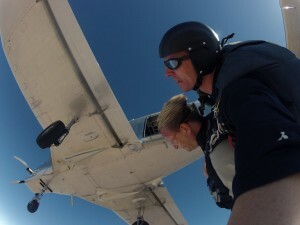 The instructor took the pics and video with two GoPro cameras strapped to his hand. Rachelle and I each ended up with over 300 pics as well as a video. I think the pics were basically taken on a timer, so some of them aren’t so interesting, but there are definitely some nice gems in there. I’ve shared a bunch of them below if you want to see what it was like. Overall it was a fun experience. Would I do it again? Sure, I’d be up for that, but I can’t say it would be a big deal to repeat it. It takes a fair amount of prep time for roughly 5 minutes of excitement. That’s sort of like standing in line for a couple of hours to go on a thrill ride. If you’re really in the mood for it or if you’ve never done it before, then go for it. Otherwise, I might question if it’s worth the effort. I might go again someday, but for now I’d rather keep exploring in other directions. 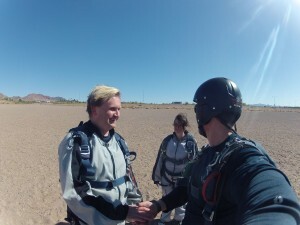 One of my readers told me that after his first jump, he’d never want to do it again. He said it would be worse to do it a second time since now he knows what to expect. I feel the opposite. I think it would be easier to do it again, now that I know what it’s like. I imagine this is a very individual thing though. I had grown up with a bit of a fear of heights. This might have been instilled in me from falling down stairs when I was just a baby. Being in tall buildings and looking down never bothered me, but climbing up a very tall, steep ladder and then knowing I’d have to come back down… that typically made me pretty nervous. I would do it anyhow, especially if it was needed of me, but I would do so very slowly and cautiously, as I wanted to be sure my foot was very secure on each ladder rung before continuing down to the next. But skydiving — would that trigger any nervousness due to the involved height? I wasn’t sure. I guess there was only one way to find out! 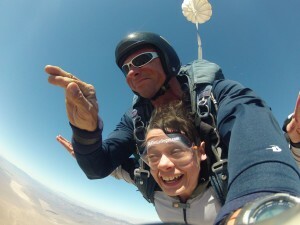 The few days leading up to our scheduled skydive were generally pretty relaxed and excited for me, in terms of my emotional state. Although, at times, I would find myself thinking about it and getting inexplicably scared for no real reason. I would push those random thoughts aside and ask myself, “What are you doing? This fear is something completely imaginary! You’re completely safe and sound right now, and yet here you are putting your mind — and thus body — through a fearful state. That’s not very helpful. Why do you want to create that emotional experience for yourself? …You know you don’t. So stop it. Simply turn your thoughts and vibe to something else that you do want to experience.” And so that’s what I would do. 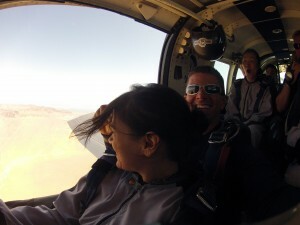 I would imagine myself being very happy and excited to skydive — because, in reality, I was! — and I’d imagine everything going perfectly smoothly in terms of safety and procedures, etcetera. I’d imagine what it must be like to fall through the sky, take in the beautiful surrounding views from above, and the perfect exhilaration I’d feel doing something so delightfully insane like jumping out of an airplane for the mere pleasure, fun, and experience of it all. 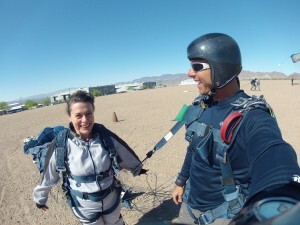 My skydive partner (i.e. 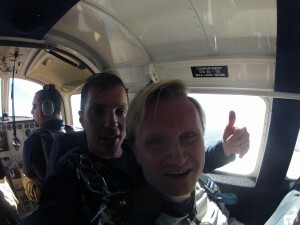 the skydive professional I was attached to for the tandem jump) and I were to be the first ones out of the plane. It’s funny how that came to manifest, because I recall when Steve and I were talking about it the night before, he asked if I had a preference over being first or last to leave the plane… and I had said I thought it would be fun (and even a little challenging — in the positive sense) for me to go first, while he had said he thought it would be interesting to go last. And that’s exactly how it played out: I was the first out of the plane, and he was the last. I figured that going first would give me less time to be nervous. Not that I wanted to just get it over with, but growing up, and even in my 20s, I had a tendency to wait to be the very last person to do something in a group setting, like a school presentation or acting scene, or a dive during swimming lessons, etc. This time I wanted to challenge myself to be the first. The way reality played out couldn’t have been better. 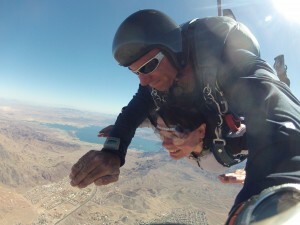 Free-falling is a delightful sensation that I would very much like to experience again. (Having a working parachute is a prerequisite, however!) It gives you an opportunity to see and feel the world in a whole new way. It almost feels like flying, or at least how I’d imagine it would feel to be Superwoman and have the ability to fly at high speeds — but while only being able to fly in one direction and speed. The parachute float-down was quite enjoyable too — it was relaxing, peaceful, and quite beautiful. 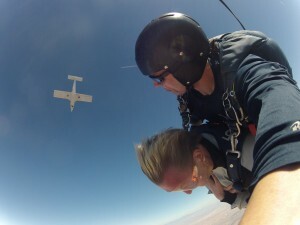 But I definitely preferred the sensation of free-falling, which felt more exhilarating and even somewhat surreal. 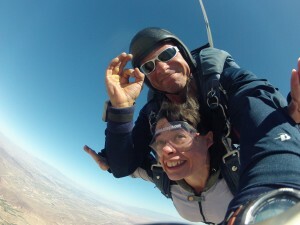 If you’re thinking about going skydiving someday, you should definitely go. Even if you have a fear of heights, I sincerely believe that you should go skydiving anyway and not let any fear hold you back. After all, the fear only exists in your mind. 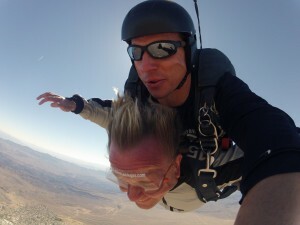 Skydiving is an amazing, delightful, exhilarating, surreal, and especially fun experience. I would highly recommend partaking in this activity to anyone. Its sensations are unlike anything you’re used to experiencing throughout your everyday normal life, and therefore, what you take away from it is going to be rather unforgettable.